As the year drew to a close, something happened last week that hadn’t occurred all year: No single story dominated the attention of a news media that had become, increasingly, narrowly focused in 2008. While the ongoing storylines of the struggling economy and the incoming Obama administration were still in the spotlight, other stories rivaled them for attention. And in the end, for the first time in 2008, no single story filled more than 15% of the time studied on television or space online or on the nation’s front pages, according to the weekly News Coverage Index from the Pew Research Center’s Project for Excellence in Journalism. The smallest level of coverage achieved by a single top story all year was 20%. And this was only the third time in six months in which five different stories received notable attention in the same week (filling 5% or more of the newshole studied). For the week of December 15-21, the economy and the Obama transition were closely followed by two scandals and a mess: the arrest of Illinois Gov. Rod Blagojevich for trying to sell a Senate seat, the financial swindle involving Bernard Madoff and efforts to rescue U.S. automakers from bankruptcy. Several factors may account for the diversity of the news agenda last week. First, Obama’s preparations for taking office had fallen into a familiar pattern. So, in some ways, had the struggling economy, and by the time President Bush decided to unilaterally help the U.S. auto industry, even that story was no longer a surprise. Finally, the Blagojevich and Madoff scandals were dramatic enough to draw attention away from the major themes that had dominated news coverage for almost all of 2008. But the largest component of the financial crisis news coverage for the week was the dramatic announcement on Tuesday that the Federal Reserve was cutting interest rates to as low as zero percent, an unprecedented move. “Yesterday when that decision crossed, people were literally slack-jawed on the floor of the stock exchange,” commented CNBC’s Erin Burnett appearing on Wednesday’s Today Show. The crisis might have been an even bigger story, but once the Fed’s actions seemed to help calm the markets, the news media tended to move on. In the end, the crisis filled 15% of the newshole studied during the week, the highest of any single storyline. In short order, the general health of the economy gave way to a different, though related narrative-whether the government would help automakers. After Congress, a week earlier, was unable to pass a bailout bill, most of the week featured speculation that President Bush might act unilaterally in deciding to aid the U.S. automakers from funds already available. On Friday, Bush ended the speculation by announcing that the government would supply General Motors and Chrysler $13.4 billion in emergency loans with another $4 billion available in February. The loans came with conditions, however, that the auto companies show significant reorganization that would allow for profitability in the near future. But the lack of surprise made what might otherwise have been a huge story a relatively modest one. The automaker aid story filled 9% of the newshole during the week, half of what it was a week earlier. It was a case of the unexpected inaction being a bigger story than the expected action itself. “It’s only when the tide goes out that you learn who’s been swimming naked,” investor Warren Buffett is credited as saying. Last week multiple news outlets used the Buffett aphorism to describe the revelations that one of the country’s best-known traders, Bernard Madoff, had been arrested and accused of running a multibillion-dollar fraud scheme. 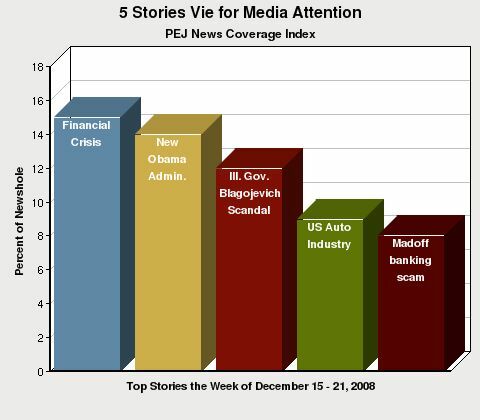 The Madoff scandal made up 8% of the week’s newshole and was the fifth largest story. The storyline about the fraud case would likely have been a major news story at any time, given the amount of money involved and the celebrities who were fleeced. But the scandal almost seemed to take on symbolic qualities as a fable of the time, jumping from the business pages to a daily spot on the front page and the top end of newscasts. The scope of the Madoff scandal grew over the course of the week as news of the people and institutions involved became known. As much as $50 billion was lost as a result of Madoff’s dealings, and among the alleged victims, the Associated Press reported Dec. 19, were real estate and publishing magnate Mortimer Zuckerman, a foundation of Nobel laureate Ellie Wiesel, and a charity run by Hollywood director Steven Spielberg, and some of the world’s largest banking institutions. “This is the biggest financial scandal, probably, in the history of the markets,” Nicola Horlick, manager of Bramdean Alternatives, told the AP. What also fueled the story was the admission in the middle of the week by Securities and Exchange Commission chairman Christopher Cox “that the SEC was aware of numerous red flags raised about Madoff but failed to take them seriously enough,” as the Wall Street Journal phrased it. The story of President-elect Obama’s preparations to take over the White House filled a familiar pattern for most of the week. Almost half of the coverage of the transition focused on his cabinet choices, and they were treated in the press as relatively uncontroversial compared with some earlier selections (such as Hillary Clinton for secretary of state or Eric Holder for attorney general). Few howled over former Iowa Gov.Tom Vilsack for agriculture, Republican Rep. Ray LaHood for transportation, or Sen. Ken Salazar to Interior. The choice that sparked the most controversy did not involve a selection for his cabinet, but rather a decision on who would offer the inaugural prayer prior to Obama’s swearing in. For that role Obama selected Rick Warren, a well-known evangelical pastor. Gay leaders objected to Warren’s previous statements about homosexuality and his role in supporting the passage of Proposition 8 in California, which effectively banned gay marriage there. So much for an inaugural honeymoon. The scandal and speculation surrounding Illinois Gov. Rod Blagojevich continued as a major story for a second week in a row, but it did show signs of losing steam. The story dropped from first place last week at 28% of the newshole to third place this week at 12%. “Most states have Democrats and Republicans. Illinois has defendants and informants,” analyst Jeffrey Toobin joked with Campbell Brown on CNN Tuesday night. While Illinois politicians continued to look for ways to impeach him, and the Obama camp for ways to distance the incoming administration from the scandal, the biggest development of the week was the anticipation of the governor making his first public comments since his arrest. If the storylines of the week were diverse, the same could be said about the lead newsmakers. Five different people appeared prominently in stories during the week – and each for different reasons. 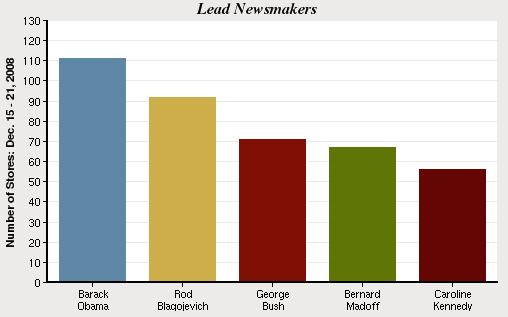 First was Obama at 8%, who continued his trend of being a high newsmaker all year. Embattled Blagojevich fell slightly from his high of 10% last week to 7% this week, but still ranked second. Third, making a long awaited comeback, was President Bush, who gave several interviews about his last days in the White House and was also the victim of an unusual shoe-throwing incident during his visit to Iraq. Fourth was the man at the center of the $50 billion fraud investment scheme, Bernard Madoff. And Caroline Kennedy was fifth due to her bid to replace Hillary Clinton as the senator for New York. Beyond the economy, the transition, and the continuation of Blago-gate, two other noteworthy stories registered significant attention on last week’s media agenda. The sixth largest story of the week, making up 5% of the week’s newshole, had to do with the upcoming 111th Congress and most specifically, whether Caroline Kennedy would be a part of it. Almost all of the stories about Congress involved her preparedness and credentials for the position. While she has the advantages of passing on the Kennedy legacy and name recognition, some commentators questioned whether she had anything else to add to the job. George Bush’s surprise trip to Iraq and Afghanistan was the 7th biggest story of the week, registering 4% of the week’s coverage. Almost all of that attention, however, was due to a moment that was not one for which Bush had hoped, let alone planned. During a Sunday press conference with Iraqi Prime Minister Nuri al-Maliki, a television reporter named Muntadhar al-Zaidi threw two shoes at Bush and yelled insults at him, calling him a dog. While Bush successfully dodged the shoes and Zaidi was quickly taken into custody, the video of the incident became probably the signature visual of the week, shown repeatedly on both American and Arab networks. Clips of the incident had already been viewed on the Web site YouTube more than 7 million times within a week of the event. Zardi even became a celebrity to many in the Arab world because his insults and frustration echoed those felt by others against American policy.